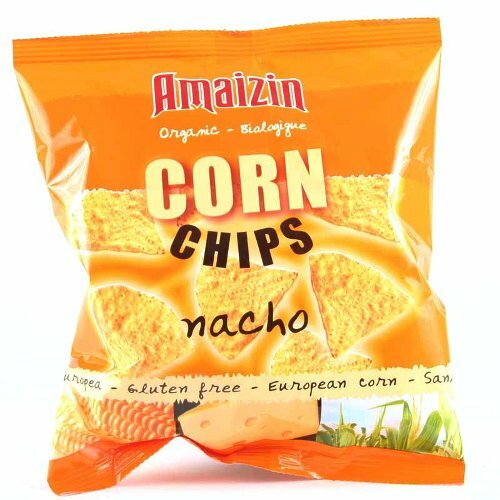 Amaizin's Nacho flavour organic Bio Corn Chips are a great snack to dunk in a dip, tasty coated with melted cheese, or extremely moreish straight from the bag. With the added cheesy nacho tang, these are bound to be a favourite. These chips are made from organic French corn, and guaranteed GM free. The corn flour makes them extra thin and extra crispy, and they are baked in organic palm oil to keep them tasty for longer. They are produced in Belgium - European production from European corn means less transportation, which is far better for the environment. The cheese flavour is produced with vegetable rennet. Corn flour* (72%), sunflower oil*, cheese powder* (milk) (2%), rice flour*, sea salt, onion*, yeast extract. The Amaizin Bio Corn Chips - Nacho Flavour - 150g product ethics are indicated below. To learn more about these product ethics and to see related products, follow the links below. Really nice corn chips. these didn't last very long. There are currently no questions to display about Amaizin Bio Corn Chips - Nacho Flavour - 150g.